This is an 11 piece 14 inch Nativity scene set. 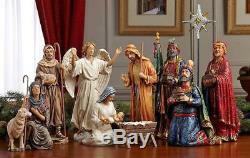 Set includes the Mary, Joseph, Baby Jesus, the Three Kings, Angel, Shepherds, manger and North Star figurines. They are made of the highest quality, hand painted polymer resin stoneware. The set includes true elements like The Original Gifts of Christmas, real gold, frankincense and myrrh. It comes in a nice gift box for easy storage after Christmas. This is the original "Real Life Nativity" set from Three Kings Gifts. It is an heirloom that will be a source of meaningful joy for many years to come as it is passed down from generation to generation. Hand painted and made of highest quality cast resin stoneware. 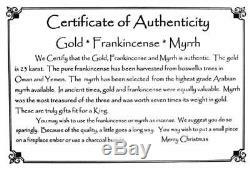 Includes the original gifts of Christmas - REAL gold, frankincense and myrrh. Joseph stands 12 inches tall, Mary sits 7 inches high; the manger is 3.75 inches high and Jesus is 3.25 inches long. The Christmas star rises from a gold & silver base on a rod dotted with flecks of stars. 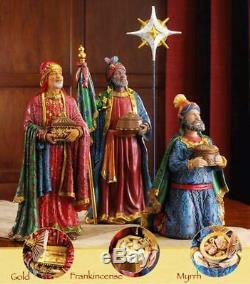 Melchior (gold): 12.5 inches tall, Balthazar (frankincense): 14 inches tall, Caspar (myrrh): 10 inches kneeling, Christmas Star: 17.25 inches tall. 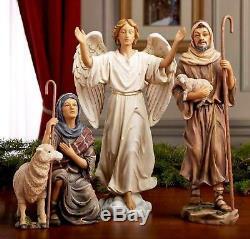 Standing Shepherd 12 inches tall, kneeling shepherd 7.75 inches high and Angel stands 12.5 inches tall. The item "Three Kings Gifts Real Life Nativity Set 14 Inch" is in sale since Wednesday, October 3, 2018. This item is in the category "Home & Garden\Holiday & Seasonal Décor\Christmas & Winter\Nativity Items". The seller is "sincerelyhers2010" and is located in Bainbridge, Indiana. This item can be shipped to United States.